A new study suggests that some stars in the Milky Way could harbor "carbon super-Earths" – giant terrestrial planets that contain up to 50 percent diamond. The research suggests that true terrestrial diamond planets can form in our galaxy. Exactly how many such planets might be out there and their possible internal composition is an open question. The finding comes from a laboratory experiment at Ohio State University, where researchers recreated the temperatures and pressures of Earth's lower mantle to study how diamonds form there. This work contrasts with the recent discovery by an unrelated team of researchers who found a so-called "diamond planet" which is actually the remnant of a dead star in a binary system. The larger goal of the reasearch was to understand what happens to carbon inside planets in other solar systems, and whether solar systems that are rich in carbon could produce planets that are mostly made of diamond. Wendy Panero, associate professor in the School of Earth Sciences at Ohio State, and doctoral student Cayman Unterborn used what they learned from the experiments to construct computer models of the minerals that form in planets composed with more carbon than Earth. "It's possible for planets that are as big as fifteen times the mass of the Earth to be half made of diamond," Unterborn said. He presented the study Tuesday at the American Geophysical Union meeting in San Francisco. "Our results are striking, in that they suggest carbon-rich planets can form with a core and a mantle, just as Earth did," Panero added. "However, the cores would likely be very carbon-rich – much like steel – and the mantle would also be dominated by carbon, much in the form of diamond." Earth's core is mostly iron, she explained, and the mantle mostly silica-based minerals, a result of the elements that were present in the dust cloud that formed into our solar system. Planets that form in carbon-rich solar systems would have to follow a different chemical recipe – with direct consequences for the potential for life. Earth's hot interior results in geothermal energy, making our planet hospitable. 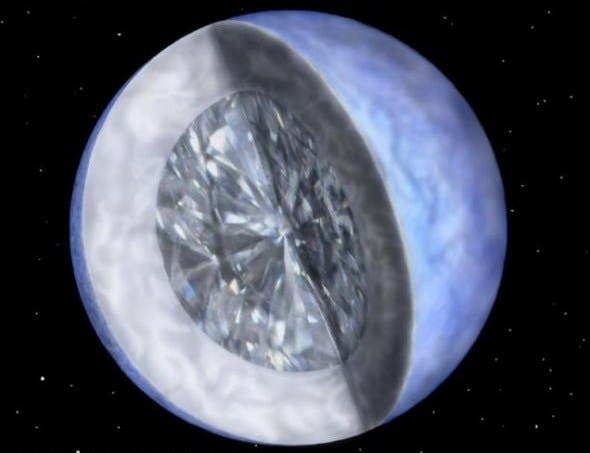 Diamonds transfer heat so readily, however, that a carbon super-Earth's interior would quickly freeze. That means no geothermal energy, no plate tectonics, and – ultimately – no magnetic field or atmosphere. "We think a diamond planet must be a very cold, dark place," Panero said. She and former graduate student Jason Kabbes subjected a tiny sample of iron, carbon, and oxygen to pressures of 65 gigapascals and temperatures of 2,400 Kelvin (close to 9.5 million pounds per square inch and 3,800 degrees Fahrenheit – conditions similar to the Earth's deep interior). As they watched under the microscope, the oxygen bonded with the iron, creating iron oxide – a type of rust – and left behind pockets of pure carbon, which became diamond. Based on the data from that test, the researchers made computer models of Earth's interior, and verified what geologists have long suspected – that a diamond-rich layer likely exists in Earth's lower mantle, just above the core. That result wasn't surprising. But when they modeled what would happen when these results were applied to the composition of a carbon super-Earth, they found that the planet could become very large, with iron and carbon merged to form a kind of carbon steel in the core, and vast quantities of pure carbon in the mantle in the form of diamond. "To date, more than five hundred planets have been discovered outside of our solar system, yet we know very little about their internal compositions," said Unterborn, who is an astronomer by training. We're looking at how volatile elements like hydrogen and carbon interact inside the Earth, because when they bond with oxygen, you get atmospheres, you get oceans – you get life," Panero said. "The ultimate goal is to compile a suite of conditions that are necessary for an ocean to form on a planet." In other research this past summer, astronomers discovered a once-massive star was transformed into a planet five times the size of Earth made of diamond. The pulsar and its planet are part of the Milky Way's plane of stars and lie 4,000 light-years away in the constellation of Serpens (the Snake). The system is about an eighth of the way towards the Galactic Center from the Earth. The researchers, from The University of Manchester as well as institutions in Australia, Germany, Italy, and the USA, first detected an unusual star called a pulsar using the Parkes radio telescope of the Australian Commonwealth Scientific and Industrial Research Organisation (CSIRO) and followed up their discovery with the Lovell radio telescope, based at Jodrell Bank Observatory in Cheshire, and one of the Keck telescopes in Hawaii. For the newly discovered pulsar, known as PSR J1719-1438, the astronomers noticed that the arrival times of the pulses were systematically modulated. They concluded that this was due to the gravitational pull of a small companion planet, orbiting the pulsar in a binary system. The modulations in the radio pulses tell astronomers a number of things about the planet. First, it orbits the pulsar in just two hours and ten minutes, and the distance between the two objects is 600,000 km—a little less than the radius of our Sun. Second, the companion must be small, less than 60,000 km (that's about five times the Earth's diameter). The planet is so close to the pulsar that, if it were any bigger, it would be ripped apart by the pulsar's gravity. But despite its small size, the planet has slightly more mass than Jupiter. "This high density of the planet provides a clue to its origin", said Professor Bailes. The team thinks that the 'diamond planet' is all that remains of a once-massive star, most of whose matter was siphoned off towards the pulsar. Pulsar J1719-1438 is a very fast-spinning pulsar—what's called a millisecond pulsar. Amazingly, it rotates more than 10,000 times per minute, has a mass of about 1.4 times that of our Sun but is only 20 km in diameter. About 70 per cent of millisecond pulsars have companions of some kind. Astronomers think it is the companion that, in its star form, transforms an old, dead pulsar into a millisecond pulsar by transferring matter and spinning it up to a very high speed. The result is a fast-spinning millisecond pulsar with a shrunken companion—most often a so-called white dwarf. "We know of a few other systems, called ultra-compact low-mass X-ray binaries, that are likely to be evolving according to the scenario above and may likely represent the progenitors of a pulsar like J1719-1438" said team member Dr Andrea Possenti, Director at INAF-Osservatorio Astronomico di Cagliari. But pulsar J1719-1438 and its companion are so close together that the companion can only be a very stripped-down white dwarf, one that has lost its outer layers and over 99.9 per cent of its original mass. "This remnant is likely to be largely carbon and oxygen, because a star made of lighter elements like hydrogen and helium would be too big to fit the measured orbiting times," said Dr Michael Keith (CSIRO), one of the research team members. The density means that this material is certain to be crystalline: that is, a large part of the star may be similar to a diamond. "The ultimate fate of the binary is determined by the mass and orbital period of the donor star at the time of mass transfer. The rarity of millisecond pulsars with planet-mass companions means that producing such 'exotic planets' is the exception rather than the rule, and requires special circumstances," said Dr Benjamin Stappers from The University of Manchester. The team found pulsar J1719-1438 among almost 200,000 Gigabytes of data using special codes on supercomputers at Swinburne University of Technology in Australia, The University of Manchester in the UK, and the INAF-Osservatorio Astronomico di Cagliari, Italy. The discovery was made during a systematic search for pulsars over the whole sky that also involves the 100 metre Effelsberg radio telescope of the Max-Planck-Institute for Radioastronomy (MPIfR) in Germany. "This is the largest and most sensitive survey of this type ever conducted. We expected to find exciting things, and it is great to see it happening. There is more to come!" said Professor Michael Kramer, Director at the MPIfR. The discovery has been made by an international research team, led by Professor Matthew Bailes of Swinburne University of Technology in Melbourne, Australia, and is reported in the journal Science.